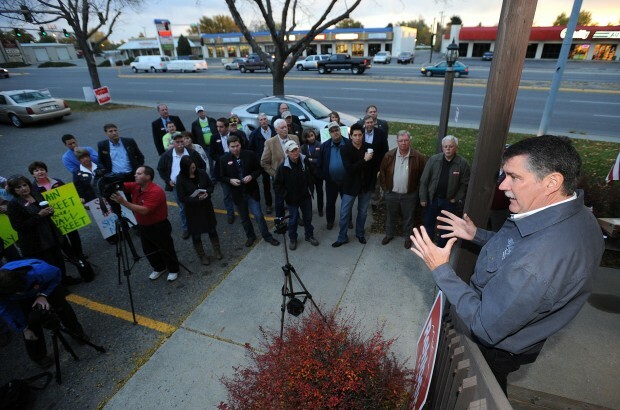 In events across the state yesterday, Representative Rehberg drew crowds of nearly a handful of people as he promised to “Liberate Main Street.” And the media was there to cover his tiny crowds and even smaller ideas. Rehberg’s personal reporter at the Billings Gazette, Tom Lutey, neglected to mention the size of the massive crowd, but a photograph shows that at least six people unrelated to Ken Miller attended Rehberg’s session in his hometown. He also neglected to mention Mr. Rehberg’s opponent in the Senate race, who spent the day actually earning his pay, working in the Senate. Contrast Mr. Lutey’s story with the one on the Bozeman Daily Chronicle and you might begin to see why find Lutey’s perpetual boosterism for Representative Rehberg is so objectionable. The Chronicle story mentions the size of the crowd (near twenty) and gave the Democratic Party an opportunity to respond to Rehberg’s spin. I think Mr. Iverson may want to do a bit more research into job creation. I’m hard-pressed to understand how awkwardly fumbling through some prepared remarks to a clutch of Republican candidates for elected office created many jobs for Montanans today. In the end, though, Rehberg and Iverson achieved their goals from a press far too willing to fill column inches with trivia and showmanship. While I understand the cutbacks that make media coverage more complicated these days, news outlets would do a great deal to enhance both their credibility and the depth of their coverage if they stopped treating these manufactured theatrical productions as if they were worth covering—and spent some real time investigating the records and results from candidates. Undeniably imagine that which you stated. Your favourite reason appeared to be at the internet the easiest factor to understand of. I say to you, I definitely get annoyed at the same time as other folks think about worries that they just don’t understand about. You managed to hit the nail upon the highest and also outlined out the whole thing without having side-effects , folks can take a signal. Will likely be again to get more. Thanks! Enjoyable article, I genuinely benefited from reading it, keep up all the good efforts. Hello! Someone in my Facebook group shared this website with us so I came to check it out. I’m definitely loving the information. I’m book-marking and will be tweeting this to my followers! Great blog and fantastic style and design. Great post, I surprisingly had a good time glossing over it, keep doing all the good thoughts. I appreciate all the work you’ve put into your site! I’m going to Tweet this out to my followers… Definitely worth sharing! I don’t discover how a lot more of the the land can acquire. This design is incredible! You obviously know how to keep a reader entertained. Between your wit and your videos, I was almost moved to start my own blog (well, almost…HaHa!) Great job. I really loved what you had to say, and more than that, how you presented it. Too cool! Real nice pattern and wonderful written content , practically nothing else we need : D.
I got what you mean , thanks for posting .Woh I am pleased to find this website through google. “No one can earn a million dollars honestly.” by William Jennings Bryan. Inspirational writing. My soul is enlightened by your type words and warm heart. Hi there, I found your site via Google while looking for a related topic, your site came up, it looks great. I’ve bookmarked it in my google bookmarks. Very nice! Do you mind if I follow you on Twitter? Thanks! What a lovely blog. I’ll surely be back. Please hold writing! We needed to stop in as well as supply you individuals the opportunity to drop by our web site so that you have the ability to look at our fantastic product. Our personnel as well as customer support team are amazing and we understand that we can fit your desires. Our capacities are a lot higher than our competitors and prefer to observe you flourish by having us on your side. If there happens to be anything we can do, please let us understand. 100 % customer peace of mind happens to be our leading target. If you watch in 3D then your eyes will be in for a treat. I thought it was heading to become some boring previous submit, but it seriously compensated for my time. I’ll publish a hyperlink to this page on my weblog. I’m certain my guests will uncover that very helpful.